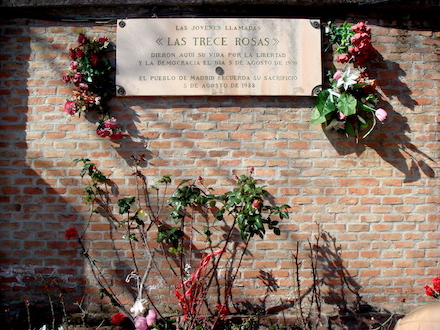 The Spanish Civil War’s victorious fascists shot Las Trece Rosas — “the thirteen roses” — on this date in 1939. 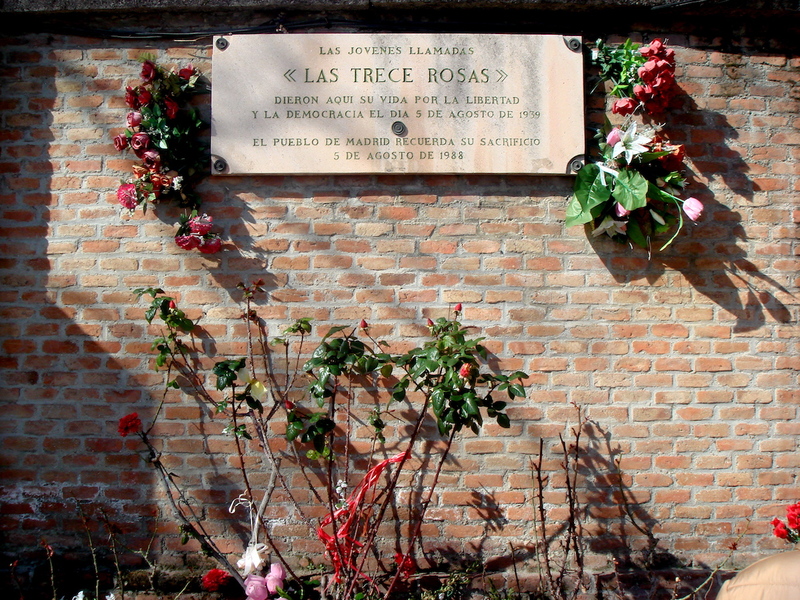 Plaque at the Cementerio de la Almudena in Madrid in honor of 13 young women shot there by Francoist troops on August 5, 1939. (cc) image by Alvaro Ibanez. Earlier that 1939, Franco had clinched victory by finally capturing the capital city after a siege of 29 months. A punishing suppression of the Spain’s leftist elements ensued, running to hundreds of thousands imprisoned, executed, or chased into exile. Our 13 Roses were members of a communist/socialist youth group, JSU, and they had been arrested in rolling-up of that organization. They were crowded into the overflowing dungeons of the notorious women’s prison Las Ventas. The affair is the subject of a 2007 Spanish film. * Gabaldon’s predecessor, the police commander under the Spanish Republic, Jose Aranguren, had been removed from his post and executed in April.